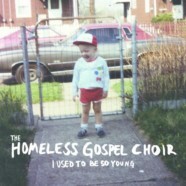 Not being a traditionalist or purist, I can usually stand any bastardization of punk or rock that crosses my path, but Homeless Gospel Choir’s (aka HGC) latest release I Used To Be So Young was something new, even for this writer. This is not to say that it was bad, but merely a departure from the norm, which is kind of the point. Although it could be easy to chalk this up to the one-man band simply being a noisemaker and pot-stirrer that would be overly dismissive. The great thing about punk is that it can either be rebellious and outspoken for a cause, or arbitrarily boisterous and flamboyant, either way, in most cases, people can usually find what they need from the music. This album is no different. With an interesting mix of songs for fun and tunes about life, HGC’s primary aim seems to be on the bulls-eye of life, having him target the very aspects of life and living in America that often go unnoticed. Songs like ‘Black Friday,” Capitalismo,” and “Some People,” ring to the heart of some of America’s oldest and oft-proved truths. Commentary on the nature of a society that values things and possessions over human life in the face of a “deal” or the problems that come from the misdistribution and accumulation of wealth are just a few of the ideals attacked in HGC’s songs. On the lighter side there are songs that address other important issues, like finding a lover with complementary tastes in music and the fear of being subjected to the songs and artists that make your skin crawl. Overall, given its content and eclectic delivery, Homeless Gospel Choir has crafted a new deviation in the punk scene with I Used To Be So Young with a perspective that reflects the sentiment first expressed in the title. It shows age and maturity as portrayed through the progression of tracks and the storytelling using modern-day tales and fables. If you’re looking for something to diversify your music collection and awaken your inner humanitarian, give HGC a listen and get in touch with your human side.